Chances are, there was a lot you didn’t know about finances when you reached adulthood. Your ignorance may have cost you money in the form of an overdrawn checking account where the bank gleefully heaped on additional fees, or credit card debt at interest rates that would have qualified as criminal usury in the Middle Ages. You may have overextended yourself when buying a car, been mystified by the APR on your home mortgage, or you may be one of those unfortunate people who ran into a financial predator who sells high-commission investments, annuities or unnecessary life insurance coverage. The bad news is that you’ll have to home-school this curriculum, since primary and secondary schools inexplicably don’t teach basic money skills, and the only way your children will be taught about money in college is if they decide to take financial planning courses that are taught at a fraction of all the colleges and universities in the U.S.
Just like any other subject, a money curriculum provides information and teaching that is appropriate to the age. You’re not going to be able to teach a seven-year-old about graduated income tax rates or the wonders of compound interest, and she’ll have no idea what you mean if you tell her that your home cost $200,000. So consider this as an age-appropriate guideline for developing money mastery in your children. Some experts say that your child’s financial education should begin as soon as he or she is old enough not to eat the money. But money is fundamentally about mathematics; when your children can add and subtract, they can start the money learning process. Step one: Introduce your children to coins first. Explain the value of coins in terms they can understand–how many are required to buy gum, a candy bar or something else they ask you for as you shepherd them past that dreaded candy display at the checkout counter. Help them learn to make change and convert one kind of coins into others. Later, you can do the same for bills. Step two: Begin giving your children a modest, perhaps even meger, allowance. Some parents choose to tie chores to money. Others don’t tie chores to money but instead offer other consequences other than monetary penalties if chores are not done. As time goes on, draw an ever-clearer link between additional jobs and extra money. When children do extra chores around the house, they recognize that their weekly stipend can be supplemented with earnings. ed rather than doled out. I froze my children’s allowances at $5 a week which gave them plenty of incentive to earn additional money as they matured. Step three: Encourage your children to save some or all of their allowance in a piggy bank. They’ll begin to see how the coins accumulate, and how that process can eventually deliver enough of them to buy something they might desire. This is the fundamental essence of saving. Interestingly, research has shown that some children are distrustful of a piggy bank if they can’t see where the money went. The state-of-the-art in piggy banks is the Money Savvy Pig, a see-through piggy bank with four slots: save, spend, donate, and invest. The goal is to help kids learn that money isn’t just accumulated to buy things. Step four: Empower your children to manage their own money. Let them decide how their allowance will be used, and let them make mistakes. If they make impulse purchases, and later want something that costs more than they currently have, that becomes a teachable moment. Step five: Incorporate your money mastery teaching into your everyday activities. In the early years, use your trips to the grocery store to explain prices. When you go to the ATM, you can explain that money doesn’t actually come from a machine. Later, when you open bills, you can talk about payment for services like the phone and cable TV. Step six: Use the power of online gaming for good rather than time-wasting evil. There are online websites and even games that families can use to get the conversation going such as Thegreatpiggybankadventure. Other examples include Feedthepig.org, kids.gov, www.doughmain.com and TheMint.org/kids. PNC Bank and Sesame Street teamed up to create fun videos and games that teach kids about money: http://www.sesamestreet.org/parents/topicsandactivities/toolkits/save. MassMutual, meanwhile, has developed Save! The Game, an app for the ipad and iPhone that teaches kids the difference between wants and needs. As your children reach middle school age, you should start to increase their responsibilities–to help them learn by doing. Step one: Start to make your children responsible for paying, out of their allowance, more of their daily expenses–school clothes, school lunches, birthday presents–and help them create a budget that allows them to save if they buy wisely. How much money should you give them? Keep track of what you’ve been spending on their needs and desires over several weeks, and arrive at a reasonable figure that exceeds their weekly or monthly costs by the amount of allowance you intend them to have. 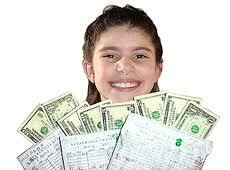 Step two: Have your children set up a savings account, and tell them you’ll match every dollar they put in there. The only stipulation is that they can’t take out the money you put in. That’s earmarked for long-term savings and/or college expenses. Step three: As you shop for groceries or head to the mall, help your children comparison shop, so they can eventually go out on their own and shop for value. Show them similar items that might have very different price tags. You might also consider using cash for your purchases when you go out with your children. They aren’t going to learn very much about money if they see you paying for everything with that magic piece of plastic. Your high school-age (pre-college-age) children will soon need to function on their own financially, so consider these finishing touches. Step one: Help your children set up a checking account, so they can get familiar with staying on top of their account balance and pay their expenses by check. Step two: Explain how debt works, and show your children a credit card statement (if you have one) that includes finance charges. A surprising percentage of teenagers didn’t understand that banks charge interest on the loans they make. Many teens don’t even realize that credit cards are a form of borrowing. Consider giving them additional money each week or month for gas purchases, and get them a gas station credit card that they can pay off each month. Step three: Let your children invest. Your child may not yet have the money to buy a Treasury bill or 100 shares of Apple, but you can buy mutual fund shares at very low initial payments, and many fund companies have programs especially set up for teens. Look together at the fund’s most recent holdings report and see how many companies you recognize–and help your children monitor the performance of the investment. Show them on a simple spreadsheet how a regular monthly investment compounds over 10, 20 and 30 years. Chances are you, yourself, will be astonished at the accumulation opportunities of the very young. There’s more, of course, such as sitting down with your children and discussing charitable donations (some parents save all their charity solicitations for six months and then sit down to go over which look most appealing) and the need to save receipts if your children go into business for themselves (such as mowing lawns or housesitting animals). Consider those optional elective courses in the overall curriculum. If your children manage to graduate from this money mastery home-school program, they’ll be far better prepared for the real world of money than you probably were. And they’ll be far more likely to succeed financially than 95% of their peers, who will enter college with only a dim idea of what a checkbook or budget is.